Companies, businesses and industrial businesses are expected to comply with the ANSI or American National Standards Institute rules about pipe markings. The standards being imposed by the ANSI regarding pipe markings deals with the style, size and proper color as well as the quantity of the markers needed to promote appropriate visibility. Self-adhesive markers – These are made from vinyl making it easy to mount because all you have to do is to peel off the back layer and install in straight to the pipe. These are perfect for outdoor and indoor use given that the pipes are dry clean and dry. Snap-around marker – This type of marker is easy to install and can help you save a lot of time since it is no longer required to clean the pipe before you mount them on. These are perfect for oily, dirty and grease surfaces indoors and outdoors. High-performance markers – This kind of marker is specially made to withstand the harsh environment outdoors. These markers are resistant to chemicals, abrasion weather disturbances as well as oil, grease and dirt. The ANSI also has recommendations when it comes to the size of the piping systems. This lets you identify what size of markers you should use. The standard recommendations refer to the height, length and the overall size of markers. White/green – This combination caution people from cooling boiler, hot water and all kinds of water. This means that the legends used for cold, hot and steaming water will make use of the white/green combination. These are just few of the most common combinations used by ANSI compliant industries. 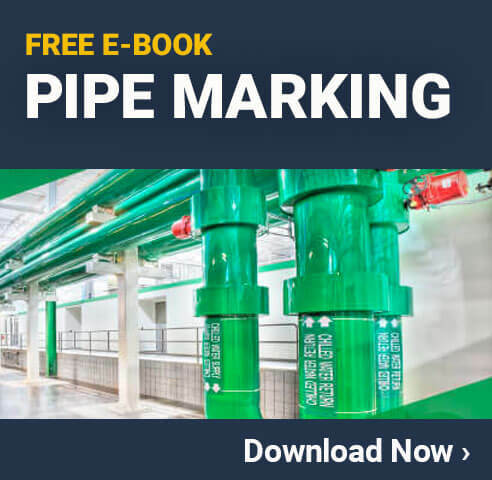 With this, it is highly important to strengthen compliance to the standards when using pipe markings in the facility because it makes the markers more visible and effective. This task is very easy as long as you are ready to start with the project. Next post Would A Flare Be a Bad Kanban in Starbucks?